Marcus has been with AMR Ohio for six months and has conducted himself with the utmost professionalism to everyone he comes in contact with. 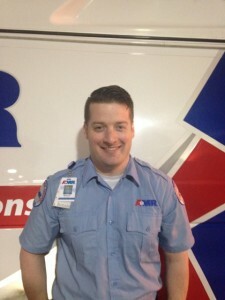 He is a recipient of numerous patient compliments for his exceptional demeanor and care, and he had the ability to demonstrate these traits on an emergency call in December. Marcus began treatment of a 53-year-old patient complaining of chest pain. After an assessment, 12 lead EKG and IV, the patient became unresponsive. Marcus’s partner began CPR while Marcus prepared to defibrillate. CPR was resumed after defibrillation. Moments later, the patient regained a cardiac rhythm, regained consciousness and actually complained the chest compressions hurt. The patient was transported to a nearby hospital, rushed to the cardiac Cath lab, underwent open heart surgery and was able to spend another holiday with his family. Marcus is a four year veteran of the United States Navy and has received two Navy Achievement Medals, a Good Conduct Medal and a Global War on Terrorism Medal. He is working on a Bachelor of Science degree in Emergency Management. Marcus is a welcome addition to the Ohio team.